Looking for ways to improve 3D architectural rendering? Modern technology has brought down 3D architectural rendering techniques to a simple yet sophisticated business. As the concept advances over time, you are under pressure to provide your clients with photo-realistic imagery. As an architect, you need to fulfill your customers’ expectations to the best of your ability. Photo-realism is a major goal for CG artists, yet one of the most difficult skills to master. The best 3D rendering techniques require careful planning and precise attention to detail which is time-consuming. These tools and methods impact the quality and realism of your 3D rendering to a great extent, let’s see how. Using techniques such as photorealistic architectural rendering can drastically change the visual effects of an image. 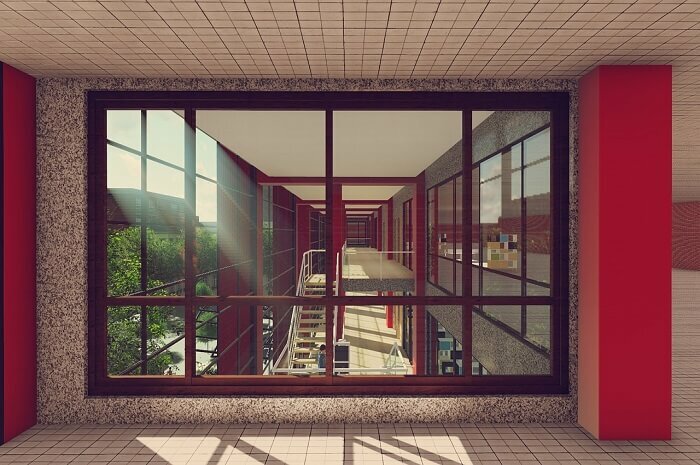 Though SketchUp and Revit are amazing design tools in themselves, using Photoshop can go the extra level of creating a photorealistic rendering. Vignette – It leads the viewer’s eye towards the centerpiece, which needs to be done correctly to achieve the best effect. Bevel – It gives a slight roundness to man-made images on the computer, by bringing out the minor details and using highlights from the nearby light for a realistic effect. Chromatic Aberration – Color rendering does not naturally occur in CG lighting, therefore visual artists use this technique to add realism to the image. Keep your client in mind when you are designing, as they can’t relate to the room if it looks lifeless. Photoshop architectural rendering brings in that oomph factor and breaks the stereotype that 3D images look unrealistic. Avoid using a focal element like a plant or artwork which will automatically attract the viewer’s eyes to one corner of the room. The design should be taken in as a complete whole, and not in separate parts. Moreover, it’s better to zoom in on small sections of the area, instead of taking an overall shot for the entire scene. Realism is the key: Photorealistic rendering in 3ds max helps in creating professionally photo-realistic images and to give them a lifelike edge. Other methods include beveling, which uses lighting highlights for a real-life effect. Using IES lighting profiles also work beautifully to recreate the real-world lighting, while Linear Workflow helps you to work with the different color spaces as displayed in your input and output. Try Photorealistic Rendering Solidworks that enables you to design quick and innovative designs through Photo View 360, Architectural Walkthrough and CAD animation. Sometimes, a simple image can look blank and stagnant on its own. Add life to the image by using people, objects, and shadows as they help in providing vitality to the scene. Placing people is easier than placing objects due to a complicated sense of perpendicular and parallel lines. However, you need to consider the positioning of the person for the best effect. Your aim in creating a successful 3D architectural rendering project is to not create an idealistic vision but to create a natural one. Spectacular Maps helps you determine and give a glossy effect to your objects and highlights any surface faults to maintain realism. You can also add textural details and cracks to parts of your objects, or simply go asymmetrical as no model is uniformly flawless. If you follow the above-mentioned steps above, you will certainly start creating photorealistic architectural rendering designs. BluEntCAD is known for its quality architectural procedures and is highly experienced in architectural 3D rendering. Get in touch with the experts to know more about our services customized to your personal needs.